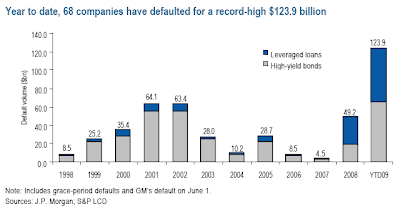 JPMorgan released the latest results on corporate defaults. Year to date we are at 68 defaults with $124 billion of paper (compared to the previous high of $64 billion in 2001). The actual default rate for bonds hit 8.4%. However a number of firms were able to roll their distressed debt. The creditors know that forcing a company to file will result in poor recoveries (potentially zero) in this environment. However if they agree to roll the debt and sometimes lower the notional (decrease the loan balance), they stand a chance to recoup something at a later date and maybe get some interest in the mean time. Including these "distressed exchanges" the default rate was actually at 13% for HY bonds. * For corporate loans the default rate hit a record of over 10%. * 30 investment grade companies totaling $106 billion have been downgraded to junk. "Year to date for bonds, the average recovery is 20.11% (based on 28 companies), compared with... Moody’s long-term average of 36.7%. For senior secured loans, average recoveries this year are 43.07% compared ... with 57.6% last year, and the long-term average of 71%." Ouch! The credit markets are open and there is a frenzy of refinancings and new debt issuance. That should significantly reduce default rates going forward, in many cases delaying the inevitable unless the economy improves. The longer the corporate credit window stays open the more stability we should see as firms continue to restructure their balance sheets. We expect a pullback and possibly a major correction in credit at some stage this year.